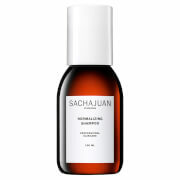 Combat dandruff with the Sachajuan Scalp Shampoo; a lightweight, daily treatment that soothes dry, itchy scalps and helps eliminate flakes. Fortified with Piroctone Olamine and Climbazole, the gentle formula delivers anti-fungal benefits without using excessive toxins or stripping away essential oils. Balancing a delicate blend of Rosemary Oil, Menthol, Salicylic Acid and Ginger extract, it helps maintain optimum moisture levels while sweeping away dirt, oil and impurities. Hair feels soft, refreshed and revitalised, while the scalp feels comfortable and calm. Massage into wet hair. Allow 1–2 minutes to work in. Rinse thoroughly. Follow with your favourite conditioner. Aqua (Water), Sodium Laureth Sulfate, Cocamidopropyl Betaine, Sodium Chloride, Piroctone Olamine, Climbazole, Hydrolyzed Wheat Protein, C12-13 Alkyl Lactate, Lactic Acid, Butylene Glycol, Zingiber Officinale (Ginger) Root Extract, Salicylic Acid, Menthol, Rosmarinus Officinalis Leaf Oil, Polysorbate 20, Sodium Benzoate, Potassium Sorbate, Sorbic Acid.